The reason people like me go to festivals is for that occasional flash of wonder when a programmer selects a film that would ordinarily have slipped beneath your radar and it rocks your world. That's how I feel about George Tillman Junior's THE INEVITABLE DEFEAT OF MISTER & PETE - a movie that made me laugh, cry, despair and marvel in equal measure. The premise is simple. The two young kids of the title are abandoned by their crack whore mothers during a hot summer in New York. Forced to forage and steal for food, to protect themselves from the cops who would put them into care and the neighbourhood thugs who would do them harm, they forge an unlikely if utterly credible friendship and alliance. The remarkably talented Skylan Brooks plays Mister, the older and more worldly wise of the two. A young kid who looks like he's never had a good night's sleep - a kid of such wisdom and strength and pride that he inspires the grudging respect of the local drug dealer (Anthony Mackie). A kid so fierce that when he finally breaks down it moved me to tears. Mister's sidekick is a young, guileless ridonkulously cute Korean kid called Pete (Ethan Dizon). A kid who desperately needs a protector and mediator. I could happily spend another two hours in the company of Mister and Pete. I totally believed in their friendship, shared their occasional joys and felt their many setbacks deeply. Kudos to Tillman Jr for finding them and coaxing such wonderful performances out of them. Kudos as well for managing to stay just the right side of manipulative sentimentality. The film never descends into Poor Joe the Crossingsweeper territory, neither does it pile melodrama onto melodrama as PRECIOUS did. The result is a beautifully shot, intimate, high stakes drama that is genuinely felt and totally unforgettable. You need to see it. 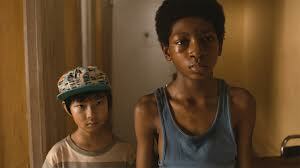 THE INEVITABLE DEFEAT OF MISTER AND PETE has a running time of 118 minutes. The film played Sundance 2013 but does not yet have a commercial release date.